Alisha started with Spring Meadow Veterinary Clinic in September of 2006 as a Registered Technician - she is now our Practice Manager. Alisha has an A.S. degree in Beef Production and Management and a B.S. degree in Animal Science from The Ohio State University. Also, she is a 2005 graduate of the Veterinary Technician program at Columbus State Community College, where she received her Veterinary Technician License. Her pet family includes a lab mix named Roofus; five cats - Moofassa, Vulture, Sparkles, Catspurr & Pepper; 2 ducks; 17 geese; a pony named Charlie; 4 goats: Anna, Oppie, Andy & Olaf, a fish and 2 cows. Alisha's veterinary interests include dentistry, pain management and client education. In her free time, she enjoys spending time with her husband Jeremiah & their daughter Claire. Tara joined our team as a RVT in April of 2013. 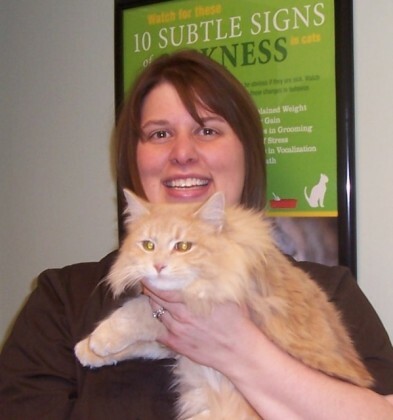 Tara has been in the Veterinary field since 2005. 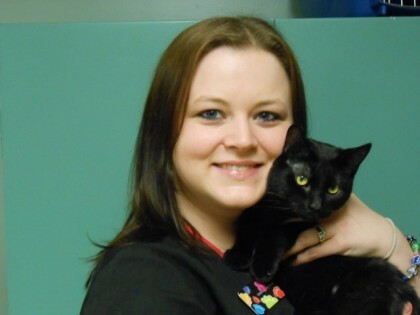 She graduated from Stautzenberger college in 2009 where she obtained her Veterinary Technician License. Tara and her husband Justin have a daughter and a son. In her spare time she loves volleyball, singing and horseback riding. Tara's pet family includes 2 dogs, Khloe (Bean) and Duke and a cat named Kion.